The intrigue about where the quarterbacks will land in the 2019 draft remains high. We are just over a week out from the process beginning next Thursday in Nashville, and still there is great mystery about this most important position … outside of Kyler Murray landing with the first-overall pick, of course. It’s clear the meat and potatoes of this first round is the defensive line, and those players will get picked through relentlessly from No. 2 right through the end of the first night. But which quarterback will be selected next, and with which pick? Teams and agents are wondering as much, and for now there are more questions than answers. Conversations with both this week have led me to believe there is a very real chance Drew Lock is the fourth quarterback off the board, and perhaps even somewhere on Day Two. If John Elway passes on him at No. 10 overall – and many people I am talking to anticipate that being the case – then could he get another crack at him on Friday night? I do believe the Broncos are intrigued with the prospect, but after striking out so many times in the draft at this position, and with Joe Flacco under contract after the trade, I tend to think the Broncos address a more imminent need with that top selection. Dwayne Haskins is the center of rumblings about a potential drop, but I can’t see him getting outside the top half of the first round. I don’t see him getting past the Skins if he is still on the board at pick 15, and you could certainly make the case for the Dolphins or Bengals nabbing him. The highest you’ll hear Haskins going is the Giants at sixth overall, but if you made me guess today I’d have the Giants waiting until later in the weekend to dabble with a quarterback. I think they pass at No. 6, and I don’t see Haskins there at 17. I’ve heard the Raiders were super impressed with Haskins, and could they take a blue-chip pass rusher at No. 4 and then, with picks 24 and 27, make a move up to jump Washington for Haskins? Could be. This could become a spot for Daniel Jones. The Duke QB is a polarizing prospect who hasn’t exactly wowed everyone he’s been around. But he has good size and a David Cutcliffe pedigree and I continue to hear the Patriots have taken a shine to him. Is he their pick at 32? I’m not so sure. Maybe the Patriots would move up a bit for him, or someone else does. 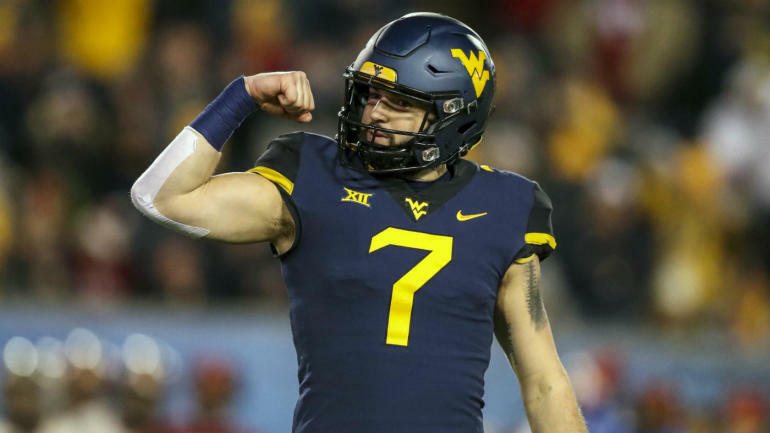 If the Giants do pass on QBs next Thursday, keep an eye on them and Carolina in regards to West Virginia quarterback Will Grier. Both those teams have spent a lot of time on him, I’m told, and Giants head coach Pat Shurmur and assistant GM Kevin Abrams were at his pro day. In the end I keep going back to at least three quarterbacks going in the first round, but there is very little consensus and when and where, which creates intrigue throughout the draft. We may not know too much more once things kick off next week, and as always all eyes will be on them. Well done by the Seahawks and Russell Wilson to hammer out a deal by the April 15 deadline. It was a faux deadline, of course, but it more than served its purpose, and helped create some closure here. In the end, Wilson’s deal extended deeper into the future than he likely would have preferred – Seattle bought two years beyond 2019 and potentially two franchise tags they had hanging over him, and also bought up three seasons beyond the current CBA (and obtained cost-certainty on Wilson before the gambling money starts flowing in and the revenues start soaring). Wilson got an incredibly front-loaded deal in return, with the $88M payable in the first two years blowing away people around the league. Plenty of others doubted they would go to that length, as well. By comparison, Matt Ryan‘s extension a year ago included $74M guaranteed over the first two years of the deal; Wilson gets $70M fully guaranteed this year and $88M guaranteed for injury over the first two years. Aaron Rodgers got just under $82M over the first two years and $103M over the first three years. So Wilson eclipsed those key metrics, as well, though he didn’t exactly transform the way deals are done. Kirk Cousins, with his $84M fully guaranteed over just three years, still stands alone as a true groundbreaker. Seattle didn’t have to alter the structure by which it does deals, or peg Wilson’s earning to what could be an exponentially growing cap as the CBA and broadcast contracts get reworked and the gambling money starts flowing in. Compromise. Albeit it big-money compromise. It won’t mean much to the next three QB extensions that will most certainly get done between now and Week 1 – Tom Brady, Ben Roethlisberger, and Dak Prescott – but it certainly does further set the stage for the next true mega-contract: Patrick Mahomes, likely coming right around one year from today. He will be the first $40M a year man in NFL history. Spoke to an evaluator who over the years has been uncanny on wide receivers in particular. Asked him who he believes the first two off the board will be. He mentioned D.K. Metcalf and N’Keal Harry, but I didn’t exactly get the sense those were his top two guys. My hunch is Marquise Brown is the first WR to go and Hakeem Butler goes higher than some predict. Continue to hear some teams have medical red flags on Rashan Gary (Michigan). He’s a first-round guy, but I wouldn’t be shocked if it’s a little lower than some project. Half the league is legitimately doing serious work on tight ends in this draft, either as projected starters or No. 2 types. I could see seven of them going in the first two rounds. Some teams believe Jace Sternberger (Texas A&M) is more of a developmental guy, but others are high enough on him that it wouldn’t shock me if he is the third or fourth tight end taken. Will bet you a dollar Jachai Polite (Florida) ends up going higher than where you see him on pretty much any seven-round mock draft you can find. Lot of natural pass rush there, too much athleticism and versatility.